We are located right in the heart of the San Joaquin Delta. We are dedicated to educating the Delta boating community. We hold monthly meetings at the Stockton Yacht Club (located I-5 to Alpine to Wisconsin, right on Wisconsin to the end of the road). Guest speakers are often invited to do presentations on any number of topics, from navigating the ships down the deep water canal to the aquatic weeds education. 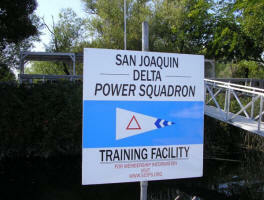 The San Joaquin Delta Power Squadron is fortunate to have an island training facility in the San Joaquin Delta. Our "Partner in Command" program is generally held at the training facility between June and September. This program teaches the "First Mate" how to handle their boat in case of emergency. Also, during the "Public Boating Course" the students are invited to board various member vessels and cruise out to our training facility. Along the way they have an opportunity to put their new knowledge to the test. Our "Public Boating Course" is available to the general public. Our "Public Boating Course" instruction is free however there is a charge for the course manual (one per family). Upon passing the exam at the end of the course, the student may apply for the California Boater’s Card and is also eligible to become of a member of the San Joaquin Delta Power Squadron. Members of the San Joaquin Delta Power Squadron are eligible to take advanced boating courses such as Boat Handling and various Navigation courses. All members are also eligible to take advantage of informative & interesting Elective Classes or Seminars such as Cruise Planning, Engine Maintenance, Radar, Instructor Development, Electronic Navigation, AIS, and many more. New boater’s may also benefit from our “Jump Start Program” as they can receive individualized instruction on many aspects of becoming a safe boater. We have several Vessel Safety Check volunteers. If you are interested in a Vessel Safety Check or would like more information about our Vessel Safety Check program please click here. We're not "all work and no play." We make plenty of time for the fun stuff too. Check out our Calendar of Events. There are a wide variety of activities available...something for everyone... including Cruise-Outs to various locations, Wine Tasting, organized Memorial Day and Labor Day weekends at the Island Training Facility, and Potluck meetings. We also have a great Holiday party which includes an excellent dinner and a silent auction and our annual Change of Watch banquet. Check out our Photo and Video Gallery!